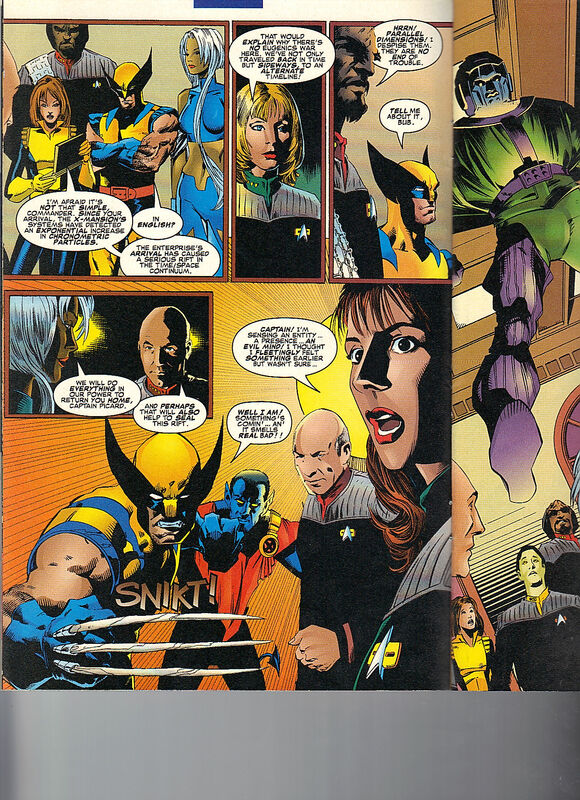 There is an Original Trek meets Original X-Men (plus Bishop, Storm and Wolverine – of course) but that one doesn’t involve Kitty so it lacks being in my collection. 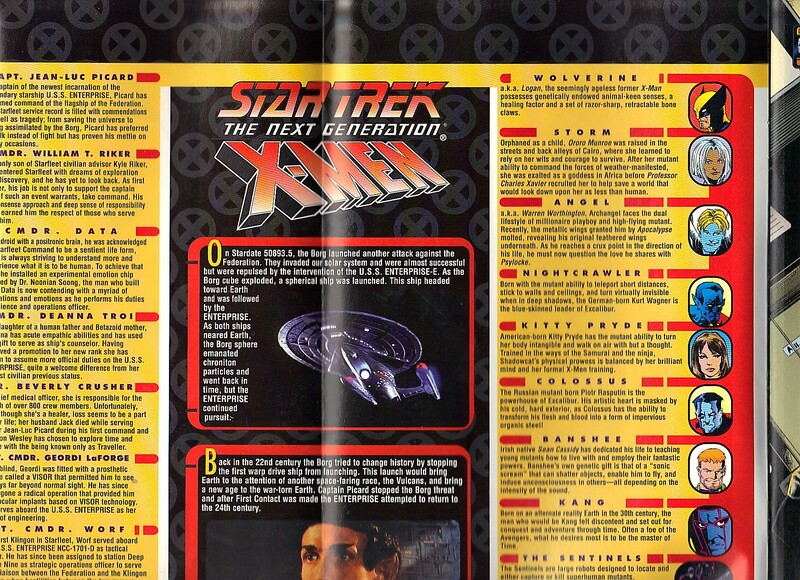 This one, involves the best series of the Star Trek franchise – The Next Generation. Largely due to them having the best captain, Jean-Luc Picard. Though those first two seasons are hard to watch, largely due to the heavy focus on Wesley Crusher and Data. So the next generation of the Enterprise meets the next generation of the X-Men. Thanks to YouTuber Nathan Travis for hosting the trailer! In that film, old nemesis (and possibly the most dangerous) The Borg go back in time to stop humans “first contact” with an alien race. Hence why this is titled, Second Contact. The Enterprise is in back in time, already but not only go further in time but they also go into an alternate universe where the X-Men are. 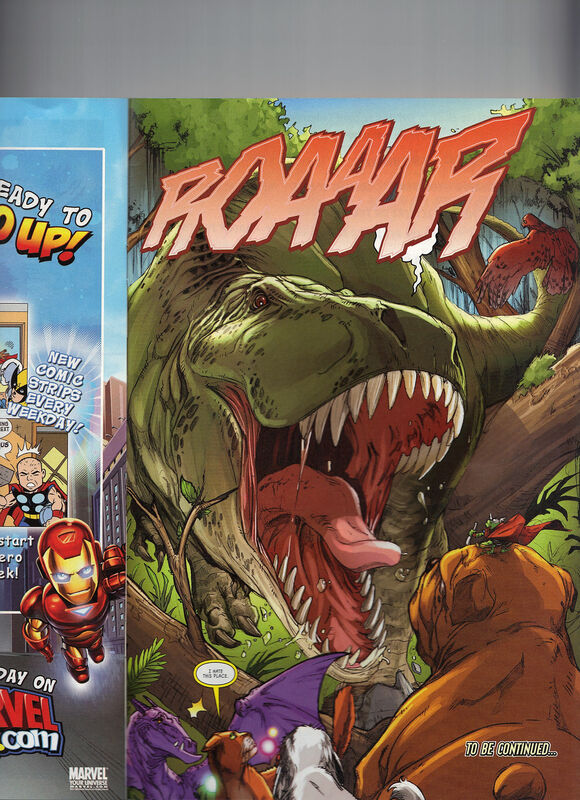 In fact, this comic starts one minute after the end credits of that film. Which I really need to see if I can find a copy of the film to watch. Star Trek : Next Generation : Captain Jean-Luc Picard, Commander William T. Rider, Commander Data, Commander Deanna Troi, Dr. Beverly Crusher, Lt. Commander Geordi LaForge, Lt. Commoner Worf and the Borg. 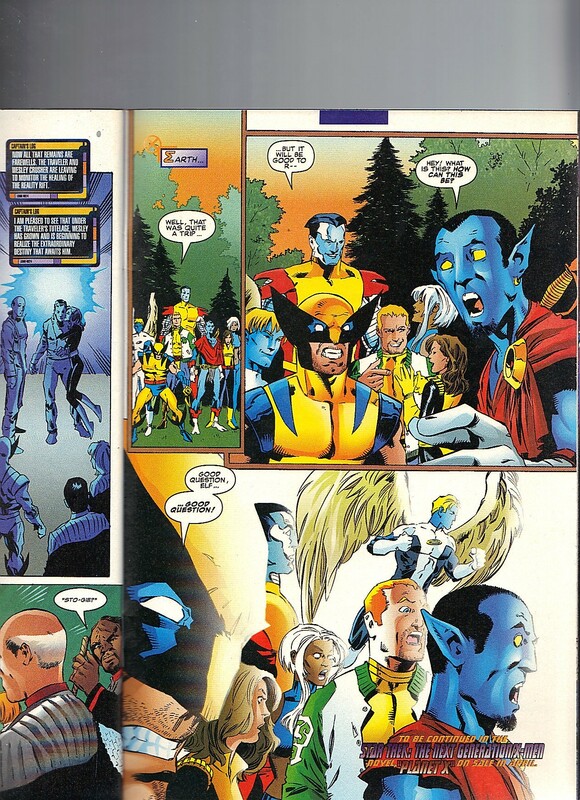 X-Men : Wolverine, Storm, Angel, Nightcrawler, Kitty Pryde, Colossus, Banshee, Kang, Sentinels and the Thunderbolts. Captain’s Log. April 5, 2063 – or so. The Enterprise is trying to wade through time to get back to their present. Once out of warp, they notice they are not near their Earth. 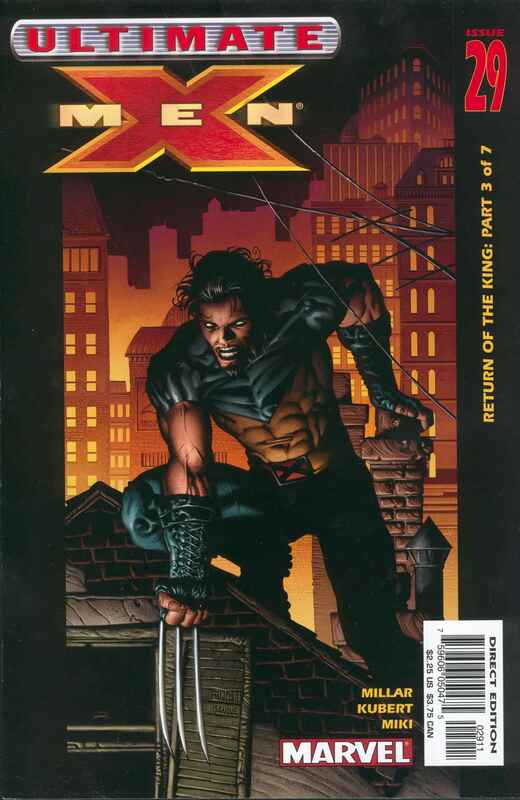 Editor “Continuity Chief” Timothy Tuohy lets us know that this issue takes place before X-Men Zero Tolerance, Heroes Return and Thunderbolts 10 – so we know exactly where we are. Their attempt to go forward in time has caused them to go backwards in time. Geordi informs them that they need to replace their processing core. Crusher tries to explain that this primitive Earth shouldn’t have that type of continuity. 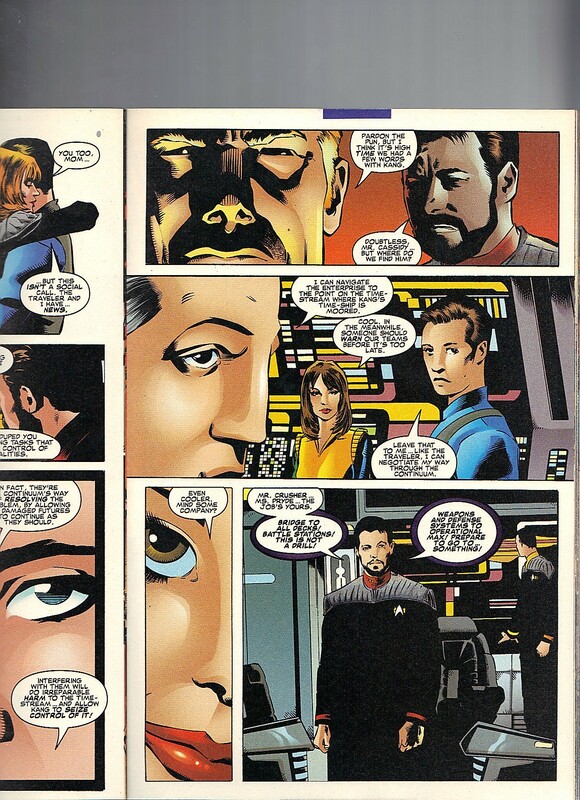 Riker corrects her, there is Shi’ar tech that has been located and will work. Little do they know how much alien life has come into contact with this Earth. Picard is going to send two away teams – to the two locations in North America that has the technology they need. 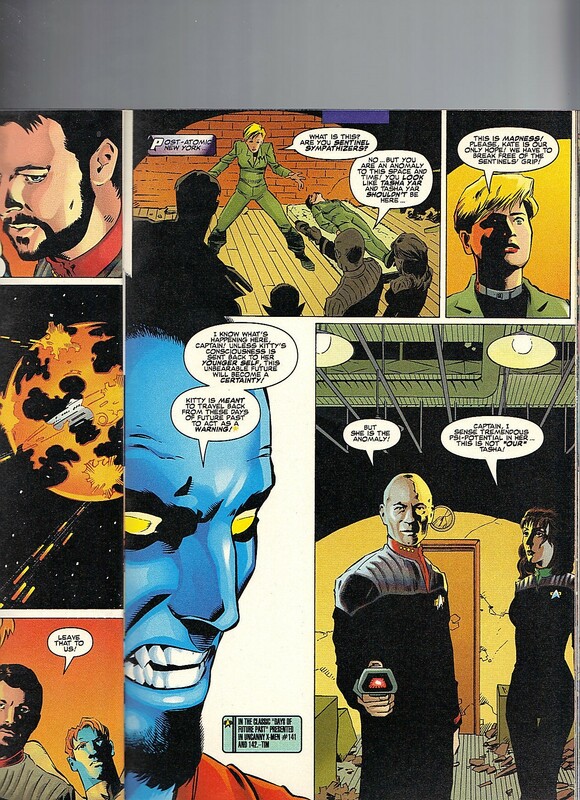 The first team – Worf, Riker and Crusher, come across the Thunderbolts. In the late 90s, in Star Trek time, New York City should be in the Eugenics War. 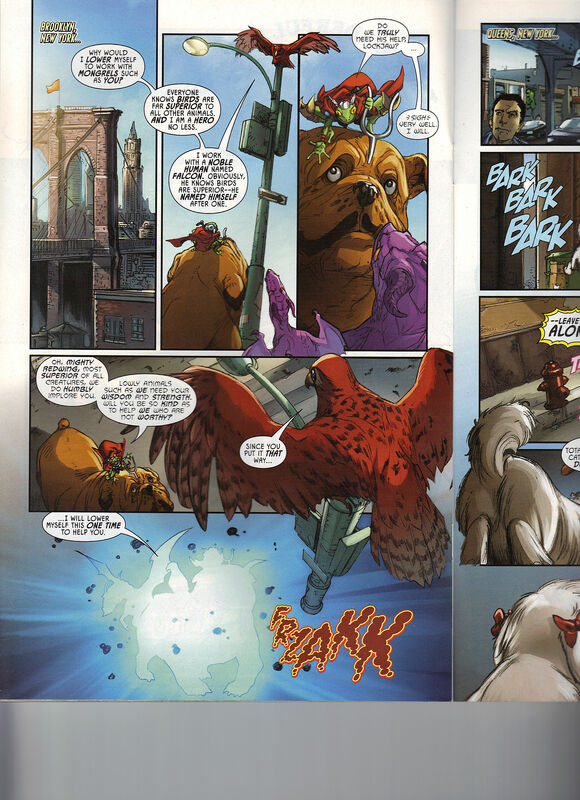 The three have come to the Baxter Building, which is currently the homebase of the Thunderbolts. Their twelfth issue is so great. Since the first team came across costume folk, they abandon that goal and try a nice country home in Westchester. 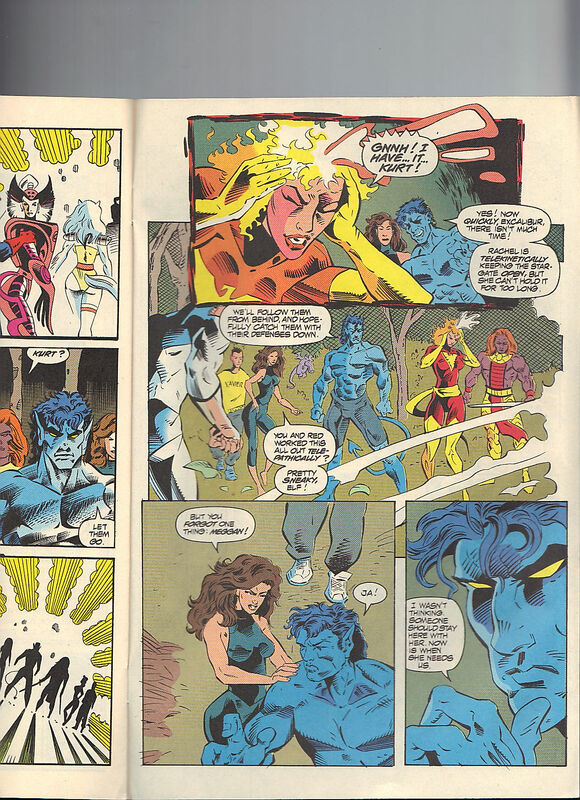 Banshee likes that the X-Men have come together, not during a time of crisis, but to just hang out. 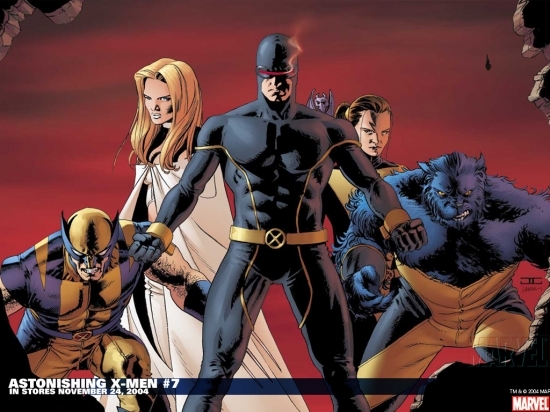 This really is a decent group of seven X-Men. 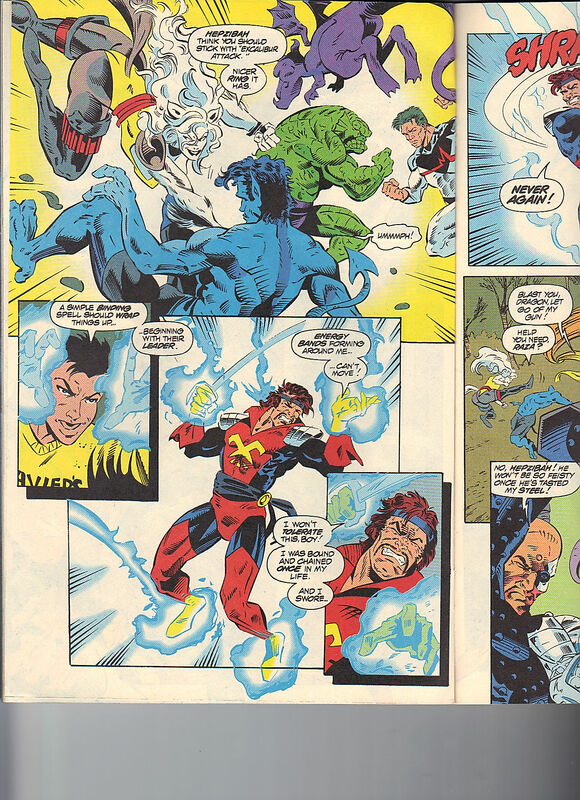 Angel serves as the Original Five placeholder; Kitty, Kurt and even Colossus represent Excalibur as well as the inclusion of Storm and Wolverine adds to the 35th Anniversary era. 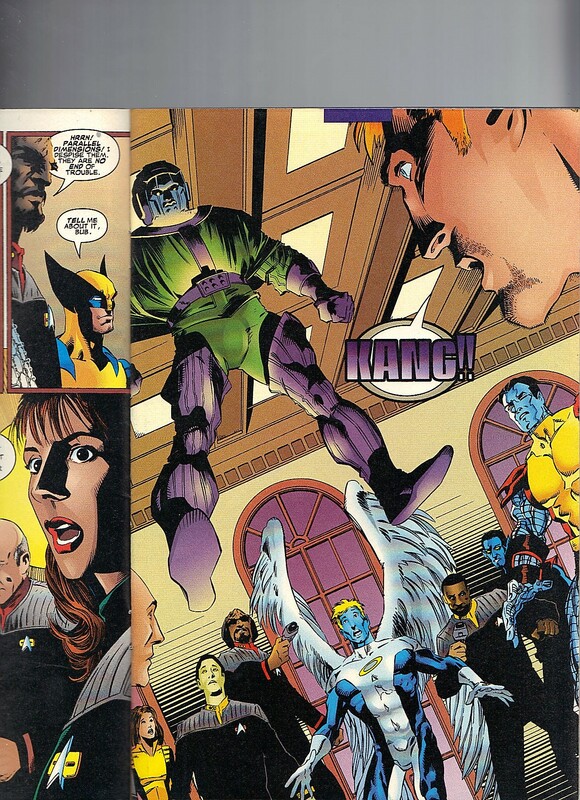 Banshee is the lone holdout, except he adds another face from the Second Class of X-Men. Kitty likes it when they gather too. The second away team is – Geordi, Data and Troi. 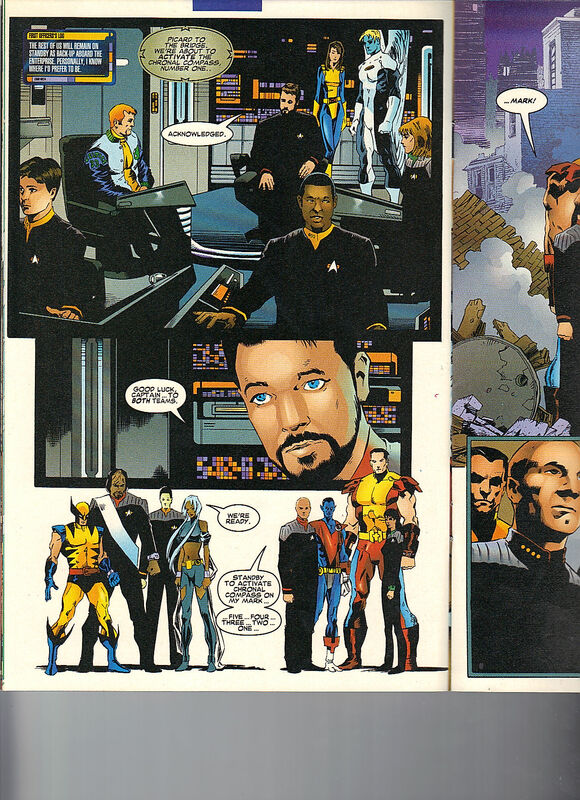 Geordi locates the Shi’ar tech behind a panel. 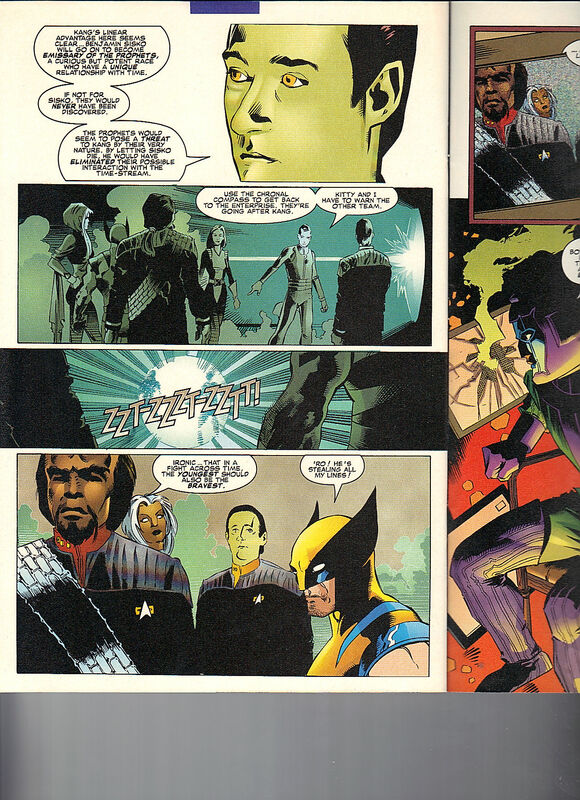 Before he can make much progress, Wolverine pops his two outer claws around Geordi’s throat. Data grabs Wolverine by the shoulder and merely flings him across the room. We get a fun match up between Data and Colossus. 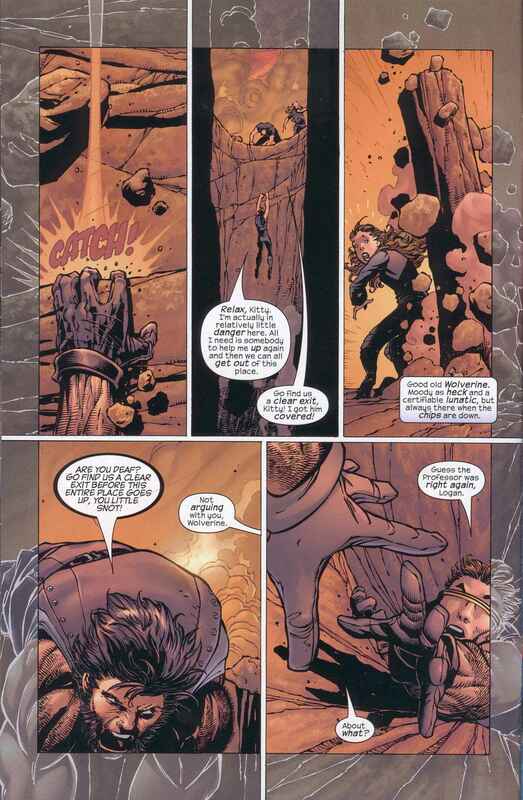 Colossus throws a punch, Data tries to catch it but ends up on the other side of the room, as well. Troi gets between the boyz and quickly explains that they are from the Enterprise. 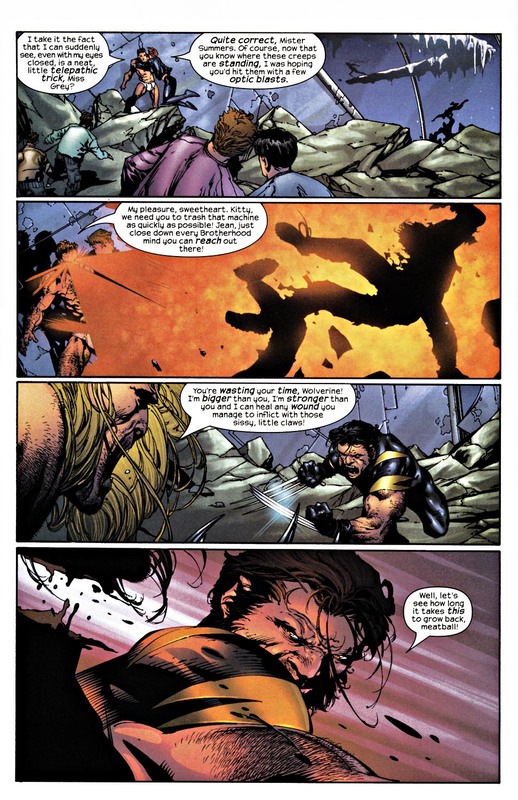 Wolverine recognizes the name of the starship from the previous teamup. Later, Picard can’t believe that he is following in the footsteps of his most illustrious predecessor. 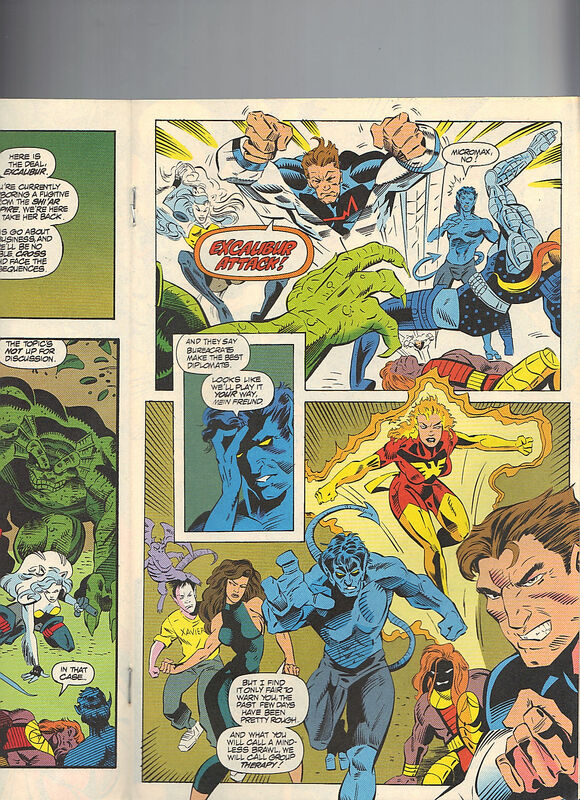 Such a great double splash page of two groups together. 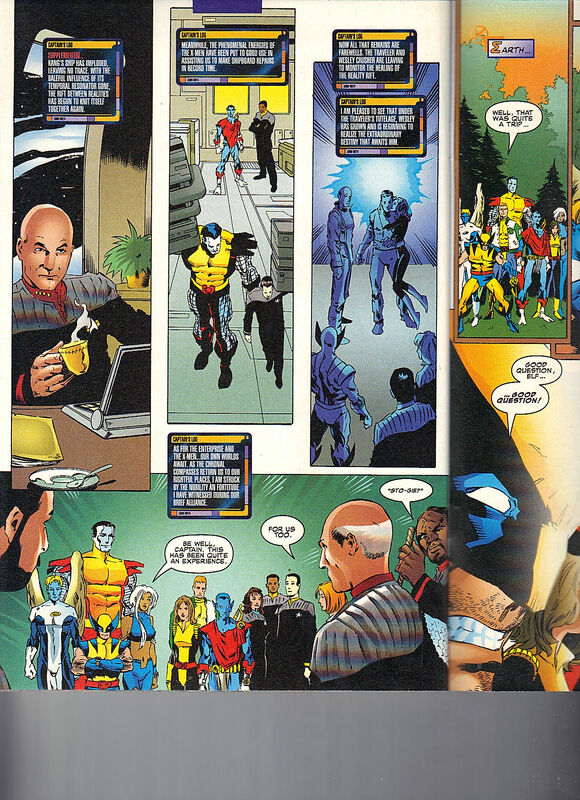 The X-Men took the time to get dressed, as did Geordi, Data and Troi. We get a very quick recap of the previous crossover. Picard also recaps his film, so now everyone knows what happened before they each woke up this morning. Kitty, as the smartest person in the room, announces that the Enterprise being here is causing a major upset in the timestream. 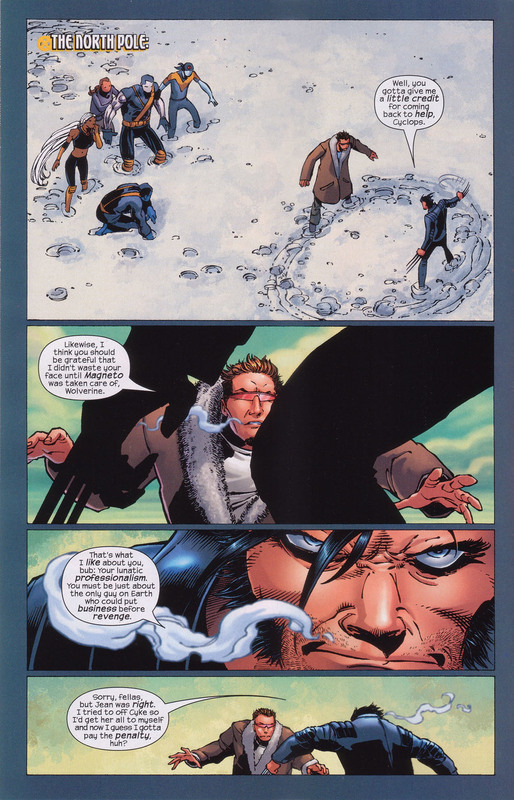 I love how much Wolf and Wolverine (who are great together) are so over timelines and alternate Earths. A stable of both franchises. Troi states that an evil presence is is about to arrive. That force is . . . Kang! 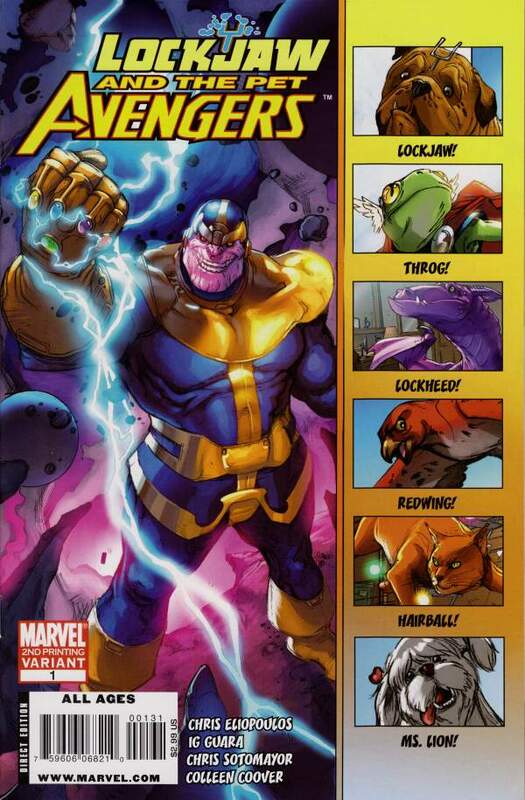 An Avengers villain but the X-Men don’t really have a time traveling foe so the villain borrowing makes sense. Always better to use an established character instead of creating a new one. Is only Banshee facing Kang? That’s not good staging on Kang’s behalf. Kang doesn’t waste too much time explaining the stakes. There is a grave disruption in the time space continuities, so the two franchises’ histories are about to mix. As fun as it is to read, it isn’t great for the characters. There are two huge anomalies that need intimidate attention. I do like Picard and Storm having asides with each other. Riker’s providing a log. Kang gave them eight chronal compass watches, so there will be two groups of four characters. Team One is – Colossus, Picard, Troi and Kurt. Team Two is – Wolverine, Data, Storm and Worf. A bit of an odd grouping for both sets. At least Wolverine and Worf makes sense. 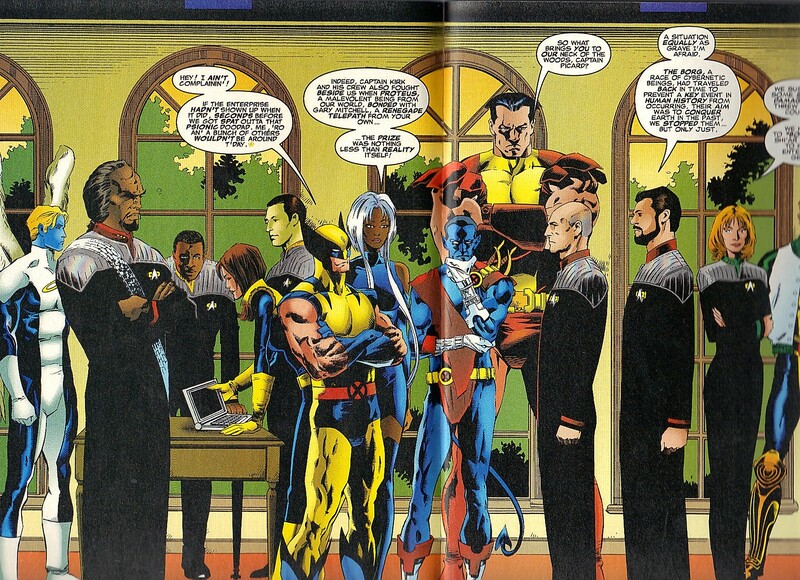 Surprised the writers didn’t try to put Colossus and Data on the same teams, or some other fun combo like Picard and Storm on the same team. 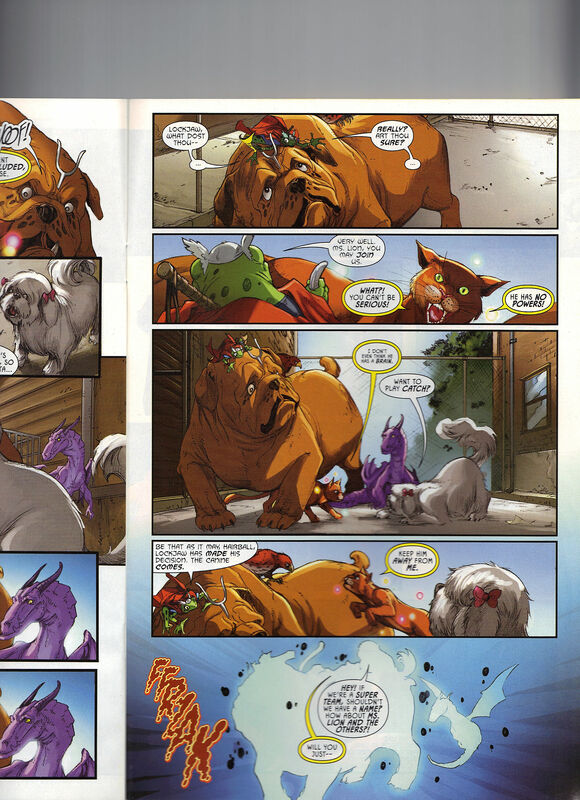 That leaves poor Kitty, Angel and Banshee just standing around on the Enterprise-E. 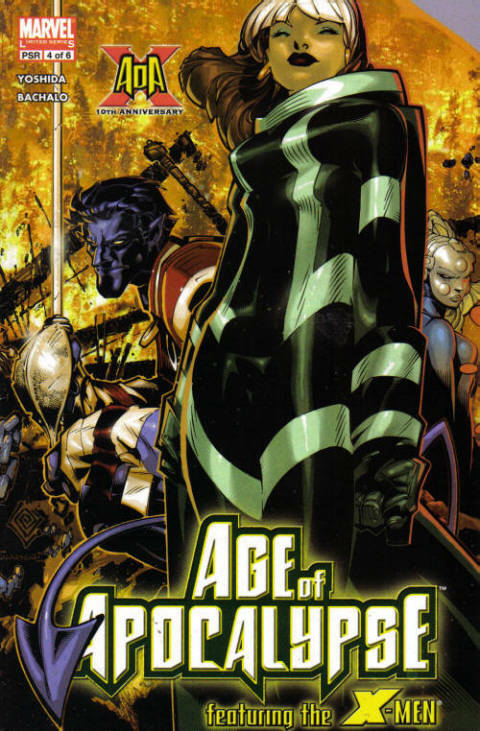 Team One goes to the Days of Future Past timeline – the most famous of the X-Men’s alternate histories. 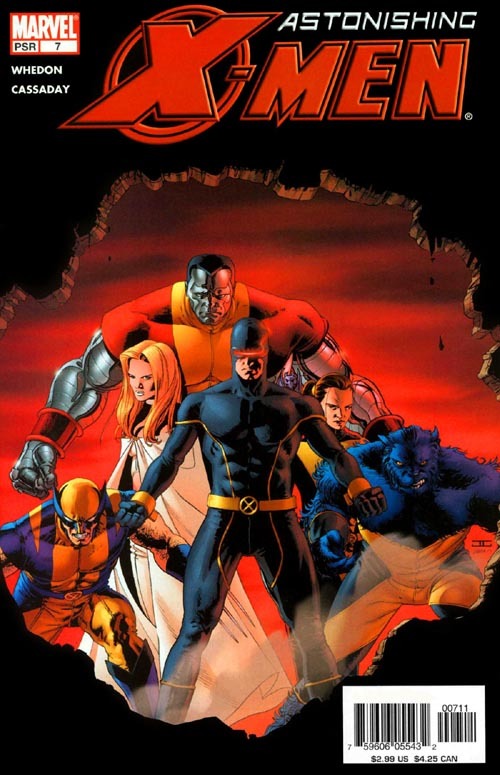 Makes sense that Colossus is on this team as his future self is in the storyline. Storm was too so she really should have been on this team. I guess Wolverine and Kitty could have been there too. Kurt talks about this as if it makes perfect sense, I guess Rachel probably painted a very visual telling of this future. 2013 is still the far future, in the late 90s. 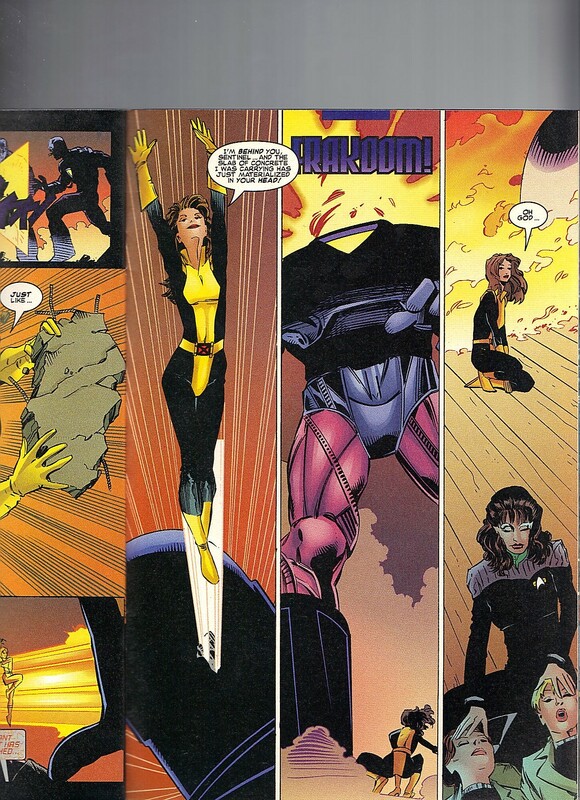 Filthy flatscans begin to throw rocks at the mutants and Starfleet officers. Sentinels arrive on scene and everyone scatters. This happens during Star Trek Next Generation’s Best of Both Worlds Part II and Deep Space Nine’s pilot, Emissary, during Captain Sisko’s flashback. Picard was assimilated into the Borg fold at this point. The Borg use his knowledge of Starfleet to make short work of the opposition. Thanks to YouTuber Psyker Sith for hosting this video. Thanks to YouTuber Mad Monkey for hosting this video. So for those folks who are not familiar with Star Trek / Borg canon, that’s the best I can do. I hope it helps. Worf and Wolverine start tearing into the Borg. Storm whips up a tornado, which may not be the smartest move on a spaceship. With a lightning strike, the Borg are taken out. Days of Future Past. Picard takes down a Sentinel. As do Colossus and Kurt. Troi feels like something is missing. Kang, talking aloud, to himself. 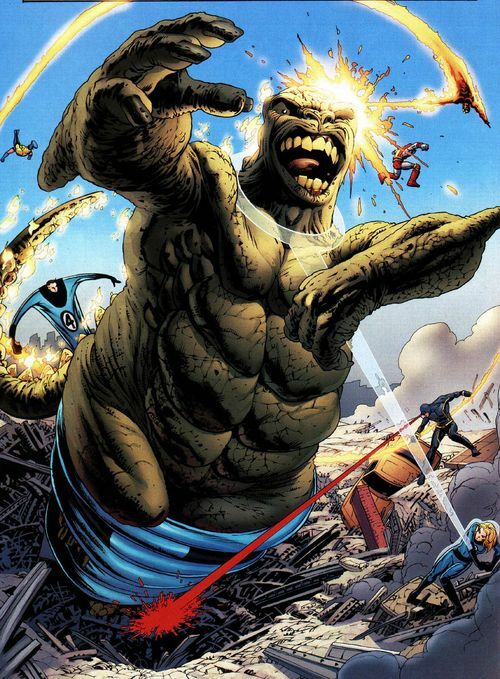 He reveals, to himself, his own plans, that the anomalies are keeping history together, so once the heroes fix those two pieces – history should be for Kang’s taking. On the bridge of the Enterprise. Two officers are getting restless, as Kitty has to watch on. 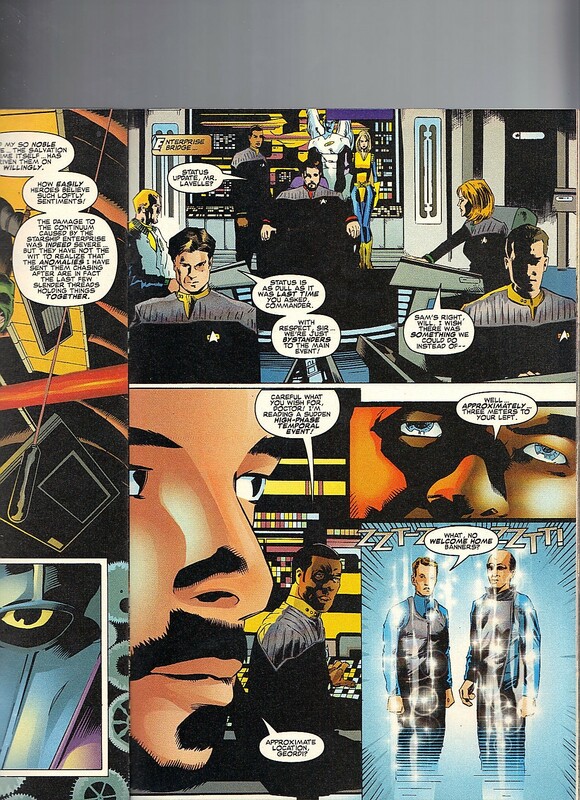 Just then, Wesley Crusher and the Traveler arrive. Beverley is excited to see her son again. Traveler explains how Kang is tricking them into doing his bidding. The anomalies need to stay in place, as time fixes itself. I do like the idea of Wesley and Kitty being a pair. Traveler is going to guide the Enterprise to where Kang is. Mr. Crusher and Ms. Pryde are going to warn the teams. As the two youngsters leave, Banshee and Angel reflect on how Kitty has grown up. Battle of Wolf 359. Sisko is giving orders to Thunderbird, so we know he is the anomaly. Now we just need Sunfire and all of the Second Class folks would be present. 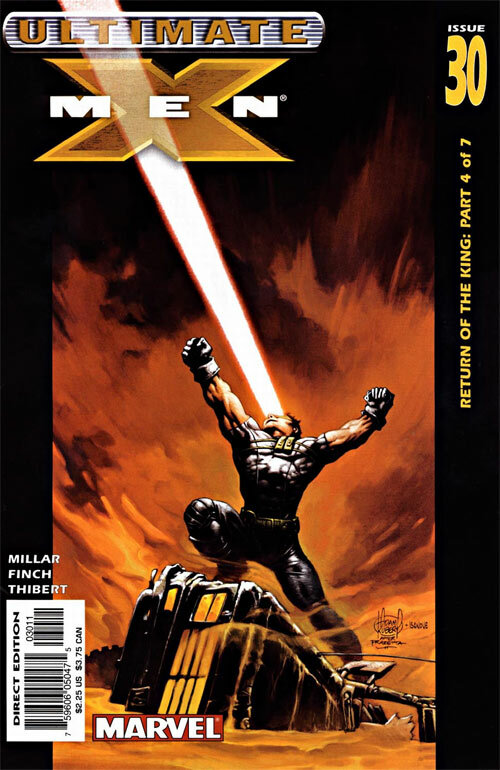 Well, and Cyclops too, I suppose. 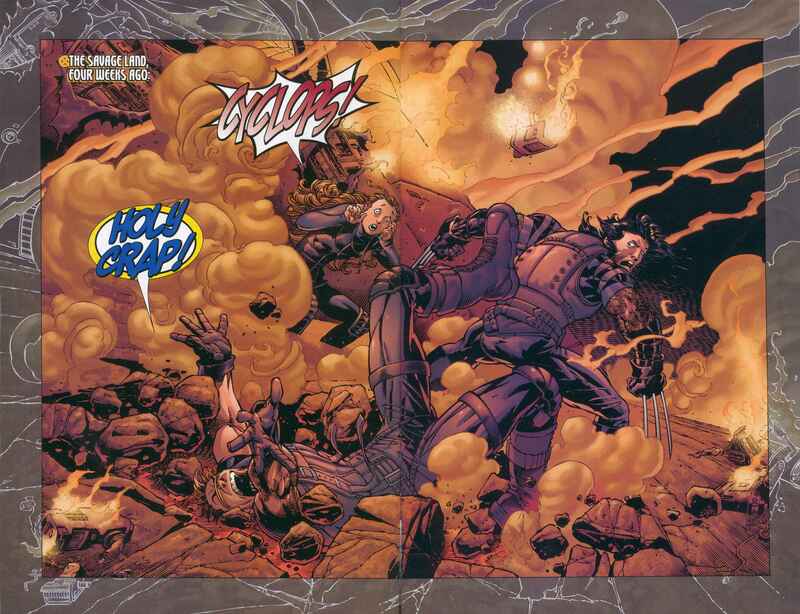 Wolverine is about to kill Thunderbird (as he’s better than Count Nefaria, I guess). Luckily, Kitty arrives and hugs Wolverine. Wesley is forced to yell at Data to not do anything that Kang told them to do. 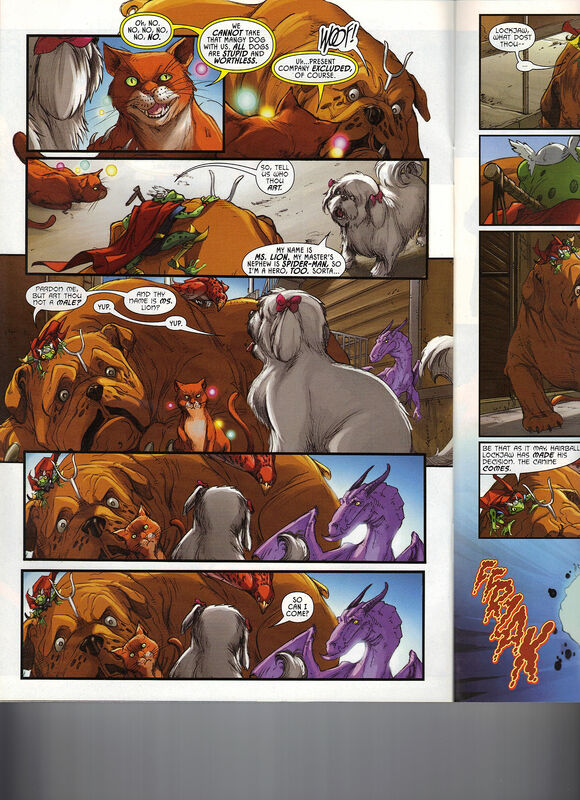 Storm wants an explanation, I would have just taken Kitty at her word. I’m good like that. Just then, Sisko is about to be killed when Proudstar takes the hit – like a champ. Data suspects that Kang wanted Sisko to die so that he never becomes the Emissary of the Prophets. Wesley tells them to use their watches to go back to the Enterprise. Kitty and him need to catch up to the other team. Worf respects how brave Kitty is. 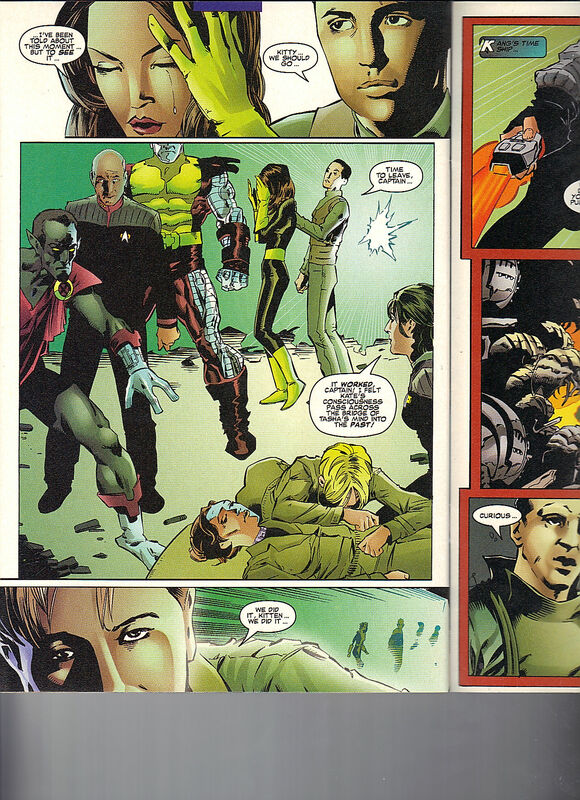 Kang breaks a monitor, as the Enterprise attacks. Kang isn’t gong to go down quietly. Days of Future Past. We get to see Tasha Yar filling in for Rachel Grey, as Kate Pryde sleeps. Well, as she’s back in the 80s and it is really Kitty’s mind that is taking the nap. 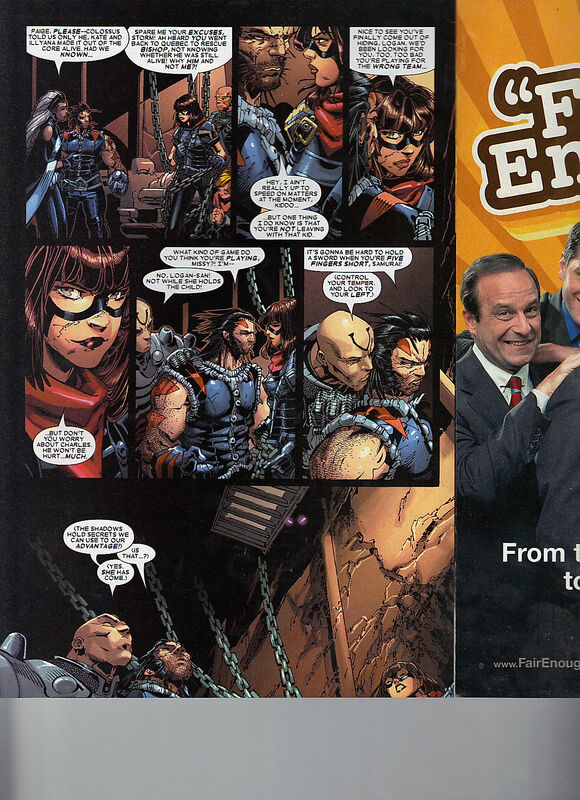 Kurt is able to work in the phase “Days of Future Past” which can’t be easy to do. Troi confirms this isn’t their Tasha Yar. Picard can’t bring himself to kill Yar. Wesley and Kitty arrive to stop what Picard has already decided to not do. Borg inspired Sentinels break through the walls. I don’t quite get how Tasha Yar was able to send Kate’s mind back to the past, that isn’t part of her skill set. She was a kick arse Security Chief. Troi volunteers to replace Yar and get the two Prydes minds back to their rightful bodies. Colossus and Kitty are taking out SentiBorgs. 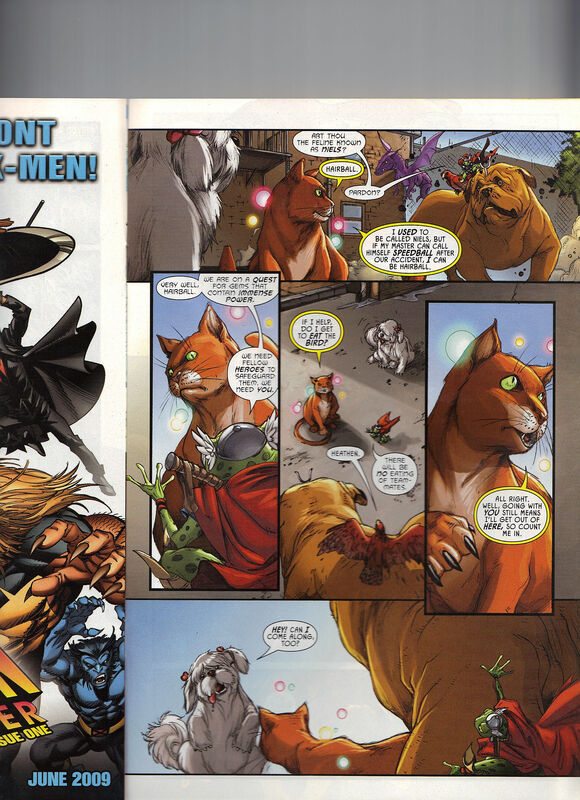 Wait, did Colossus fastball special Kitty? He’s been doing that since before Whedon did it, that’s pretty awesome. Kitty destroys a head of a SentiBorg and lands. She sees Troi syncing Yar and Kate’s minds. Kitty, for the first time, witnesses the event that has been a pretty pivotal moment in her history. One of the first real defining stories of hers. Wait, am I reading Troi’s dialogue correctly? Kate’s mind is going back to Tasha Yar’s younger mind? Shouldn’t this have been Rachel doing this to a sleeping Yar? That would have make more sense. Riker, Banshee and the Traveler are on Kang’s ship. As soon as Traveler is finished tampering with Kang’s ship, the come back to the bridge. Picard and the gang are waiting for him. The two ships begin a fire fight. The Enterprise ends the duel with a win. Captain’s Log, Kang’s ship imploded onto itself. Kitty kisses Wesley on the cheek! If only we could get a tad more of that relationship. The two teams say their good byes. The X-Men return to Earth and one second later, are beginning the adventure of Planet X, which we’ll be reviewing in a few days. Inside front cover ad is for the film, Fire in the Sky, which I still need to watch. In November 5, 1975, there was an alien abduction, at 5:49pm, in the White Mountains of Northeastern Arizona. 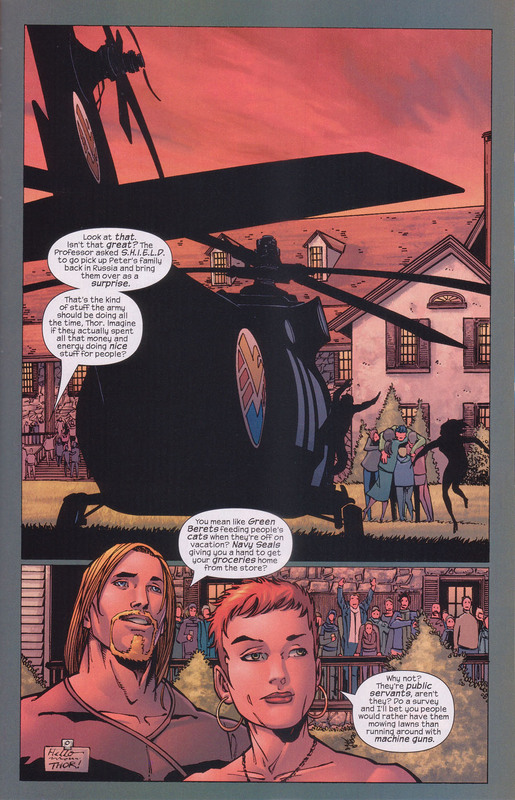 Issue opens with an absolutely amazing three page sequence of what Rachel saw, right before dying. 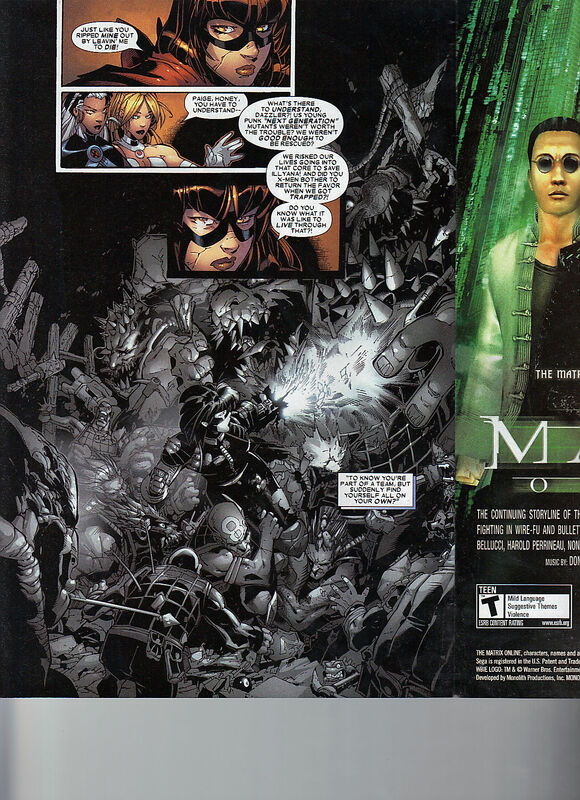 We see Jean and Scott giving her a bamf doll, Xavier dying, Ahab (pre-cyborg days), the gravesite of Days of Future Past. 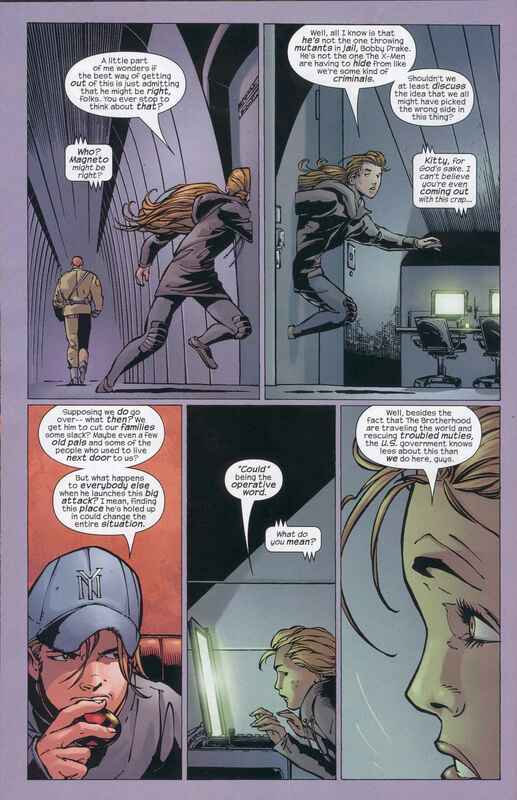 What I like, is that each panel is from Rachel’s viewpoint, so we are seeing what she is seeing. 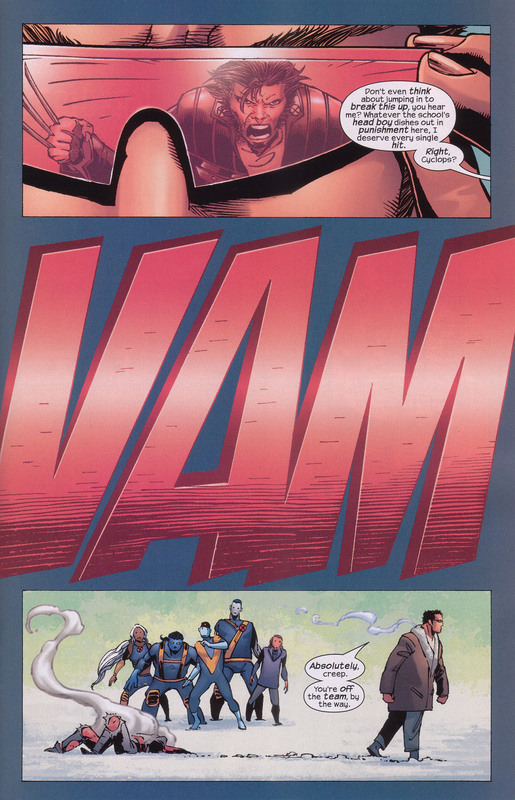 We are treated to Kate Pryde, in the classic blue Excalibur outfit, the time traveling to the present, her joining the Uncanny X-Men, watching Maddie and Scott with baby Nathan, her feud with Selene, Wolverine stabbing her. Which is pretty intense, as we get an extreme close up of Wolverine’s face with a SNIKT effect – which must be what so many people have seen, before dying. 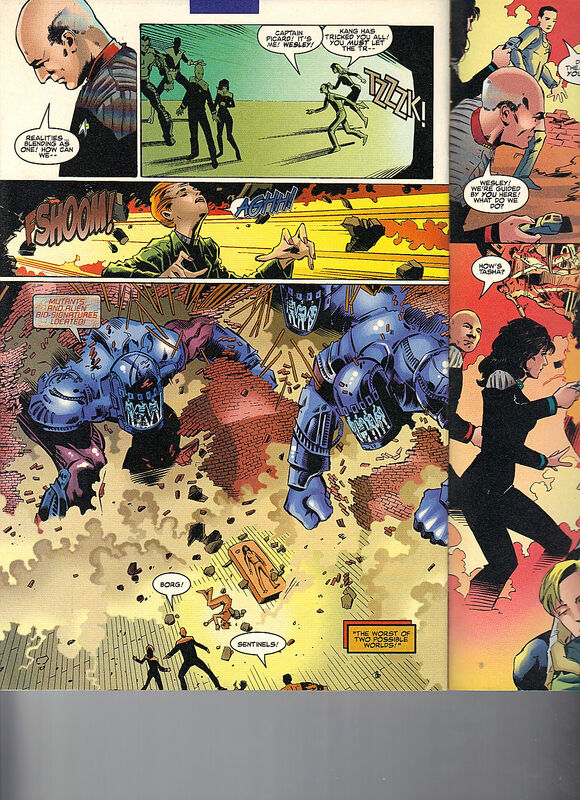 Rachel’s time with Spiral in Mojoworld gets a panel, her joining Excalibur, Ahab as even more of a cyborg and the conclusion of the previous storyline, her big fight with Necrom. Rachel comes around, surprised she isn’t dead. 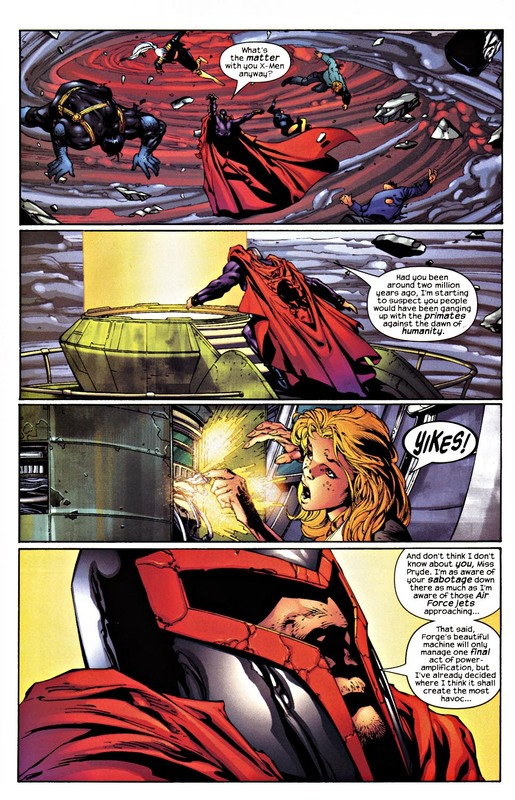 She can’t locate Necrom, the Phoenix Force informs her that Necrom is dead. On Earth. 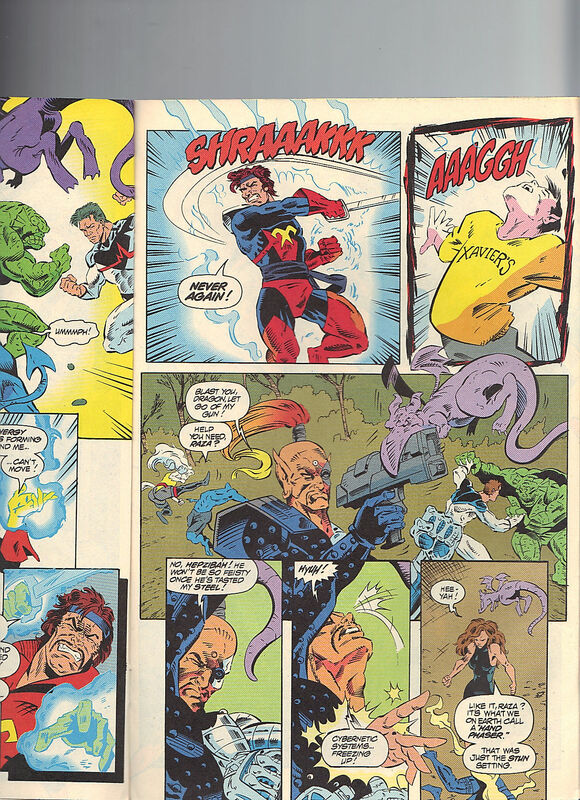 Captain Britain and Meggan are having a tough fight with the Warpies. They lose this fight and are brought to Cloud Nine. Snoop is informing Peter, the director of RCX. To be honest with you, I’m not crazy for this RCX arc. 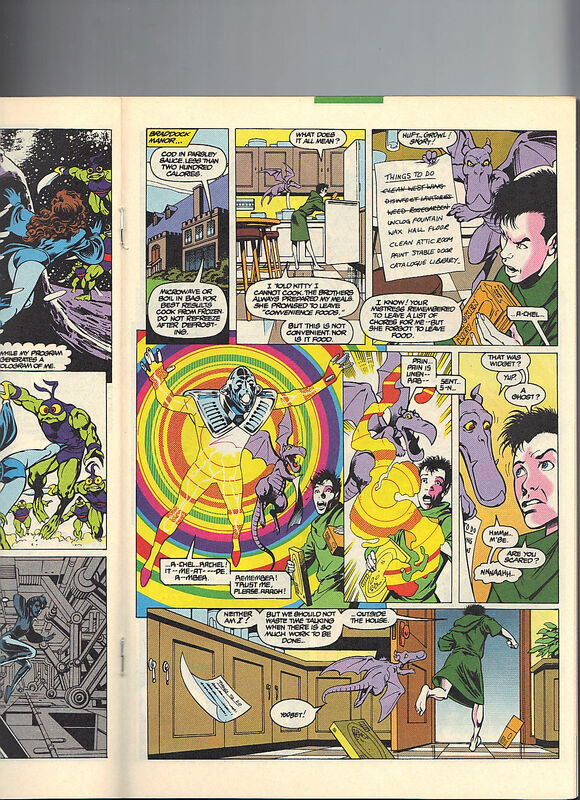 Meanwhile, a well intended doctor, Nicholas, is with Nightcrawler and Shadowcat. Kurt is training, so that Nicholas can learn more about mutants. RCX has been experimenting and they want Excalibur to cure the children’s illness. Except that they are tricking Excalibur, to be there. Kitty is super suspicious of the whole situation. Kitty fakes a reason to go off on her own, but the doctor insists that Static goes with her. All Static can say is, meep. I really do miss this art team together. Kitty has a holographic version of herself, in a space opera – so this distracts Static. There is a great moment when Kitty sees her holographic self and thinks about how old her uniform is. She still won’t end up changing it for quite some time. Now that Kitty is on her own, she can search around the complex. Braddock Manor. Now we get to the good stuff. 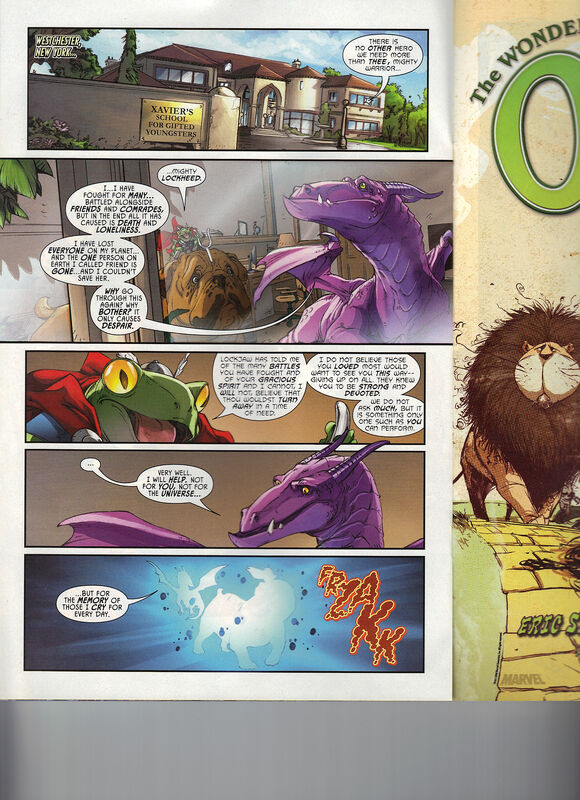 Davis’ Lockheed may be more cartoony than dragon but there is no denying the playfulness and expressiveness. Poor Lockheed is stuck with Feron, so neither can understand each other. Feron starts complaining about Lockheed’s “mistress” Lockheed angrily shows Feron the list of chores Feron is suppose to complete. Just then, Widget appears. It is trying to talk to Rachel, trying to get her to remember and trust it. Of course, Rachel is nowhere near the planet. 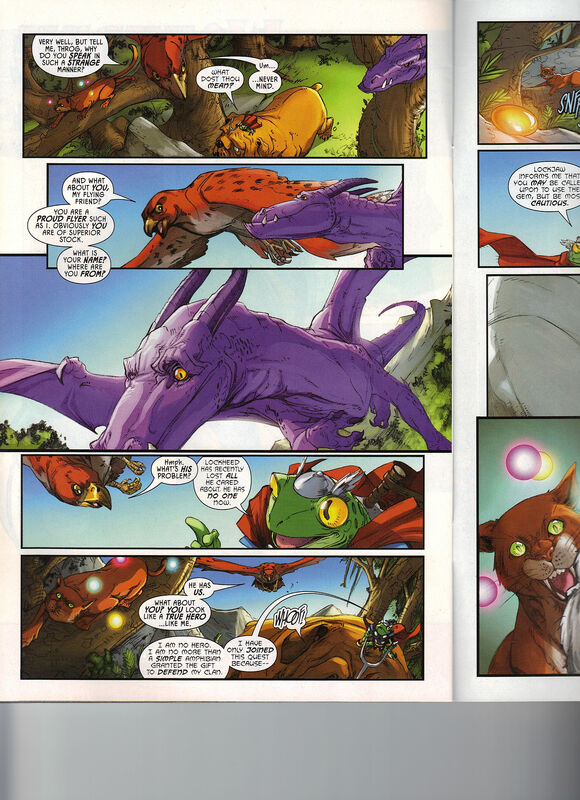 I guess Lockheed and Feron can communicate, as long as Lockheed can stick to one syllable words. Cloud Nine. Captain Britain has doctors poking him and he lashes out at him. Peter tires to calm Cap down, it doesn’t help that the Warpies arrive behind Peter – so now Cap knows that Peter is with the bad guys. 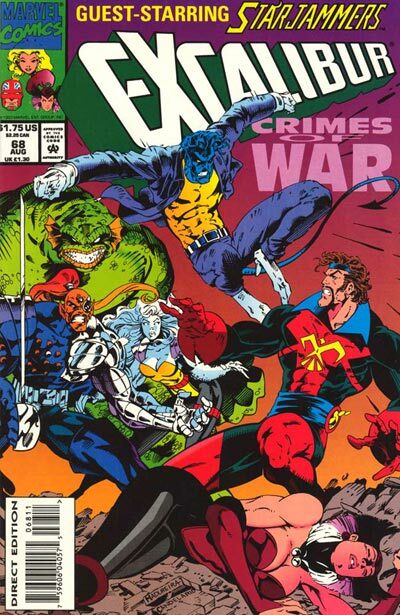 Peter tries to explain that the Warpies would never have threw the first punch but since Captain Britain did, the fight escalated. Peter explains that they might be able to answer the question of why Captain Britain’s powers have been broken, as of late. Peter explains that 64 percent of parahumans are effected with genetic destabilization. 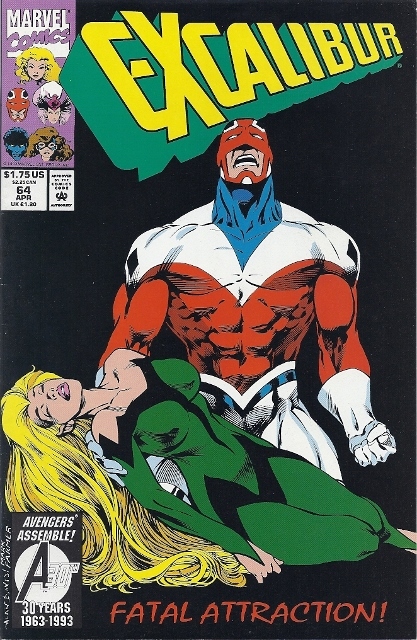 Cap has it, as does Meggan. These special children, are being created so that they can try to eliminate the disease. Kitty is watching from behind a vent, not being happy that Brian is falling for this. Ferret, another one of the Warpies, shocks Kitty. He isn’t happy that it appears to have hurt her. Luke, who looks like 90s Lex Luthor, with the big beard of red hair and the red hair mane on top of his head. I guess it would have been Lex’s “son” the “clone” but without the baldness gene. Luke is going to put Kitty in a tube, next to Meggan, microMAX, Kylun and Alistaire. 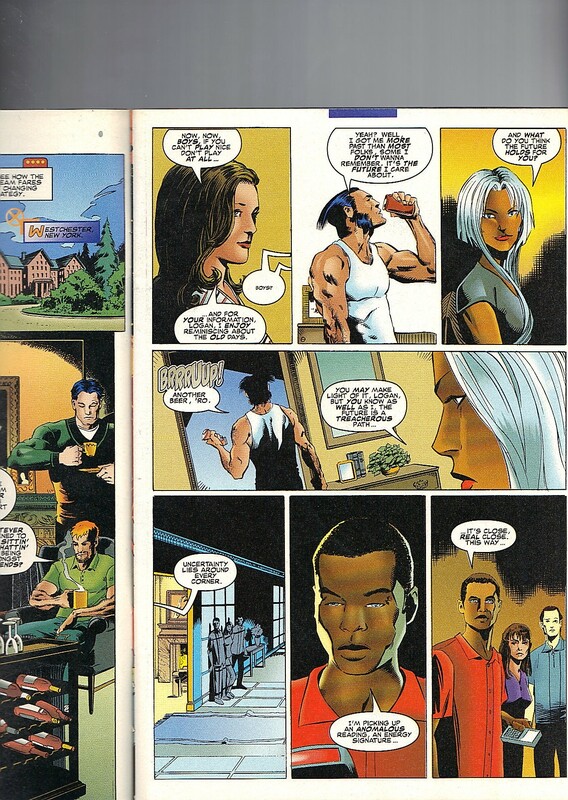 Meanwhile, a fake Kitty Pryde tells Kurt that RCX can be trusted and there is nothing to worry about. Pretty sneaky, RCX! 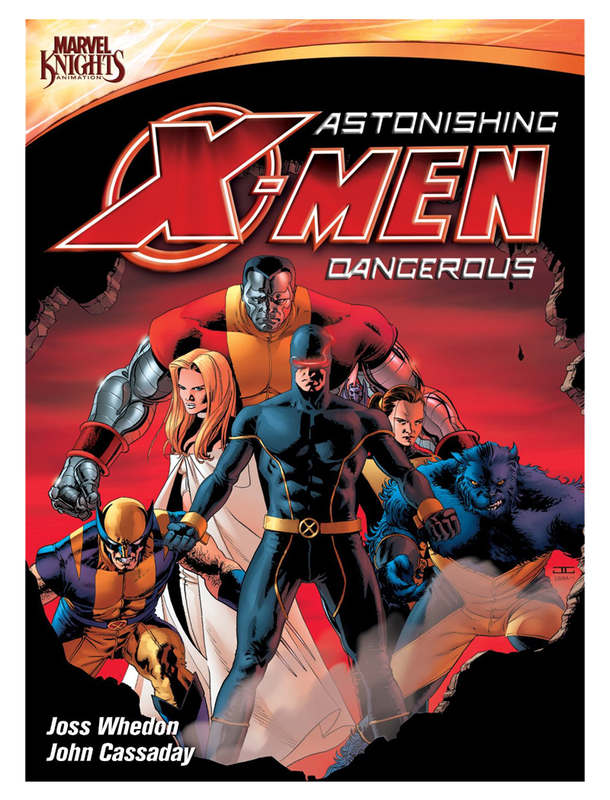 Hypeline : On Sale This Week – Dark Angel 10, Doctor Who 196, Doom 2009 4, Excalibur 94, Marvel Age 123, What If 48, X-Factor 89 and X-Men 19. Meanwhile, in deep space. 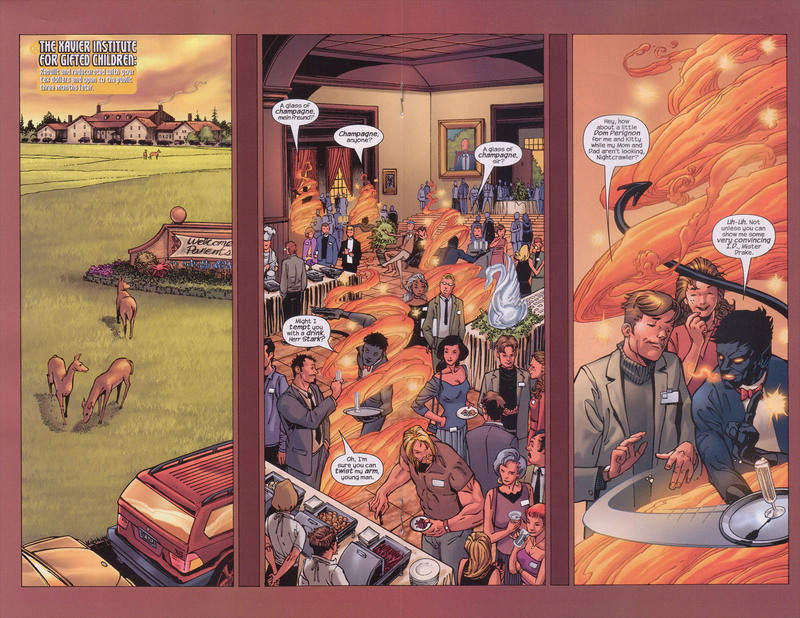 Phoenix Force Jean is continuing to have a nice chat with its host, Rachel. 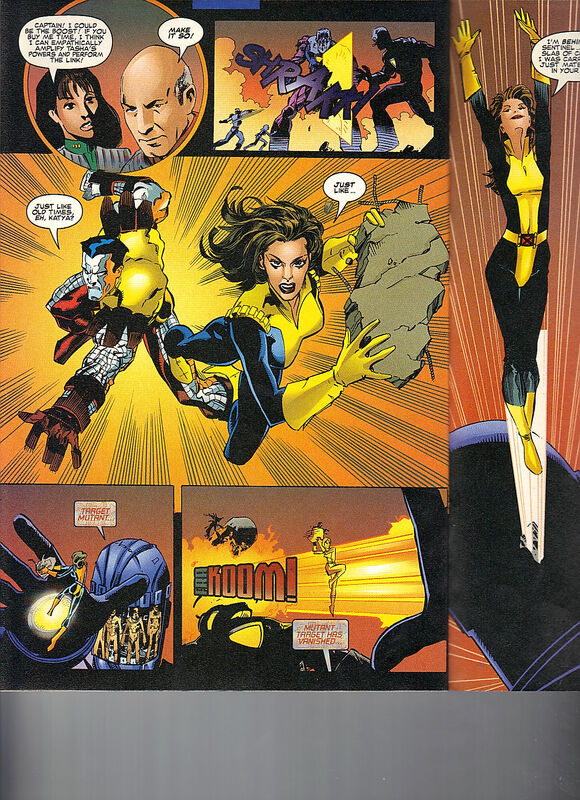 The issue ends with Rachel adopting the Dark Phoenix red suit. Which I want to say, she keeps it for a while. Next Issue – white lies and dark truths. Sword Strokes, letters from – Mark Phillips of Knoxville, TN / Dan Woodward of Fresno, CA / Helen Moore of England, Dale Critchley of Madison, WI / Robin Bielefeld / Damien Cox of Beckley, WV and Kayla Griffin of Canada. 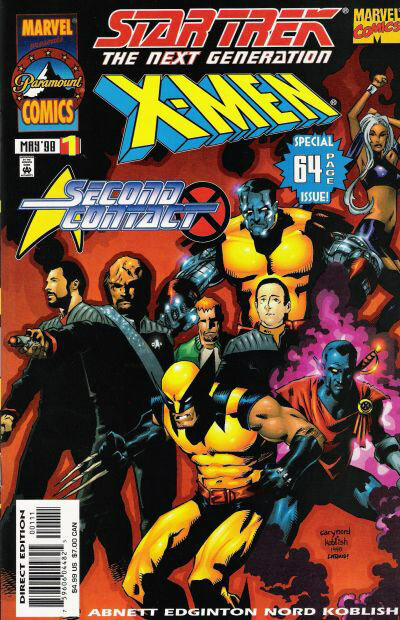 We’ve reviewed issues 66 & 67 already when we did our Days of Future Past Event Month. 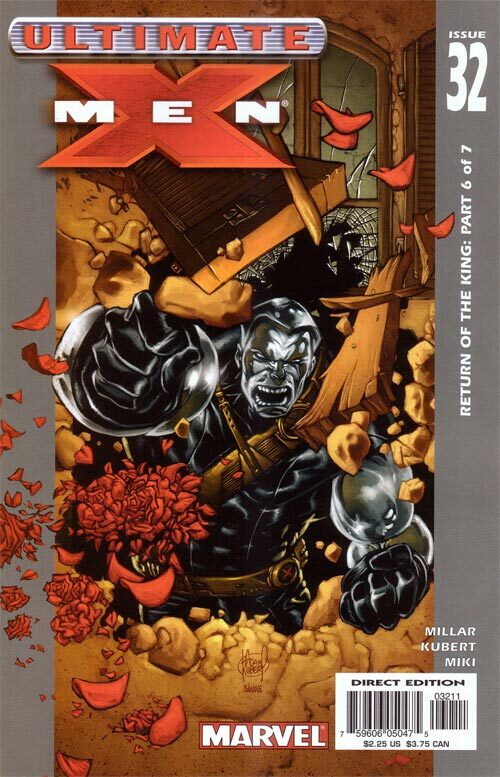 So the next issue we are going to cover is – Excalibur 68! For Super Bowl 50, we’re rooting for the Denver Broncos – my mother-in-law’s favorite team.